"I am a recovering Compulsive Comparison Syndrome sufferer. It causes me to feel envy, despair, pride and superiority. It cuts away at my relationship with God, with my loved ones, and with myself. It has promised me contentment, and yet robbed me of it. And although I don't know you at all, I'm fairly sure you have CCS, too. That's not meant to sound rude. It's just that I've rarely met a woman who doesn't struggle with it." This book is about how to spot this syndrome and its effects in your life; the view of life that causes it; how the gospel treats it; and how you can move beyond it to live a life of true, lasting contentment. 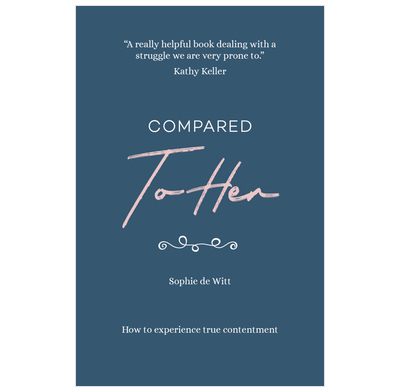 Accessible, jargon-free and dealing with a struggle that women are very prone to, this is a really helpful book for encouraging women to think about how they compare themselves to others, as well as finding the way out of such a comparison-driven life. This book helps to reveal more of the depths of our hearts and uncover sinful habits and patterns that might go unnoticed for years otherwise. The way this book pointed us to the satisfaction Jesus brings was very refreshing and powerful. Great for a book club discussion - we organised one for women in our church and there were many helpful and honest discussions which came out of the book. Great book, reading with our ladies group at church, enjoying discussing each chapter at a time each week and seeing more about why we compare ourselves to each other and resetting our thinking to be be most interested in what Jesus thinks of us not each other! This is very easy to read, and I found it enormously helpful. i instantly recognised my tendancy to compare myself with others - & the consequences! Everything which is said is based on & backed up by scriptures I knew already, but Sophies exploration is very clear and helpful. I found the online downloads available after purchasing the book to be useful too. I have already given 2 copies away - one to my son, who found it just as helpful as I did, and has passed it on to a friend.. I would definitely reccommend this book! Everything fine, good price, good delivery. A wonderful book for women, girls and mummies, who are constantly bombarded with media pressure to 'keep up with the jones's'. After reading over a week, I found contentment within my home, house, family and career, and no longer feel the need to compare my achievements to others. With relevant passages from the bible, and contemporary though, a good combination for the modern woman. I knew this book would be helpful, but I didn't realise how helpful. I have bought and given away three extra copies already! Sophie gives a name to our continual comparisons and suggests that this is an issue for every woman - a bold claim - but I absolutely agree with her. Thank you for rebuking and exhorting your sisters. This book really resonated with my experience! All women should read it. Very encouraging and helpful. This book is excellent. It exhorts us to find our satisfaction, security and significance in Christ but in such a way that we first see how sin takes hold in this area and then see how the gospel offers freedom. The application is so specific that it's impossible to dodge! 'My other half (who I honestly used to joke was my “better” half) would surely back up my confession that when we met I used to compare myself with others like something chronic! If it was not my sister, it was my parents... colleagues... friends... the lady on the tube... God himself... the list was endless. Even once I’d met Jesus, a hugely reassuring event, I quickly found myself anxiously worrying whether I was “normal” and “good enough for God” despite the sins of my youth and my very present weaknesses. On good days I would be proud to be “a success” and on bad days I would feel like “a total failure”. I swung from one extreme position on my plucked-from-thin-air ranking system to another and my mood with it! This book put the magnifying glass over the problem and with gospel insight informed me: I was not alone, why we do this, of our design, how CCS affects us and our relationships with others (most importantly, our relationship with God), that it was not meant to be like this, how we can change and why this would delight God. I can honestly say that since reading this book, I now have an explanation for my thoughts, can catch myself when I’m doing it, attempt to tell my head to drop it (with a prayer for help to God) and slowly and surely I hope I am making solid steps to a recovery from the exhausting CCS. Whilst old habits can trip us up from time to time, the knowledge of God’s amazing grace and patience He has with us as we learn is so encouraging. An easy to read book, but not an easy content. It is accurate, challenging, biblical and helpful. Would recommend it. I will be rereading it.